Canada's Kaillie Humphries has won the women's gold medal at the Bobsled World Championships in Lake Placid, N.Y.. The reigning Olympic champion and brakewoman Jennifer Ciochetti finished the competition on Saturday night at Mount Van Hoevenberg with an aggregate four-run time of three minutes, 48.57 seconds. Calgary's Kaillie Humphries won the women's gold medal at the Bobsled World Championships in Lake Placid, N.Y.. 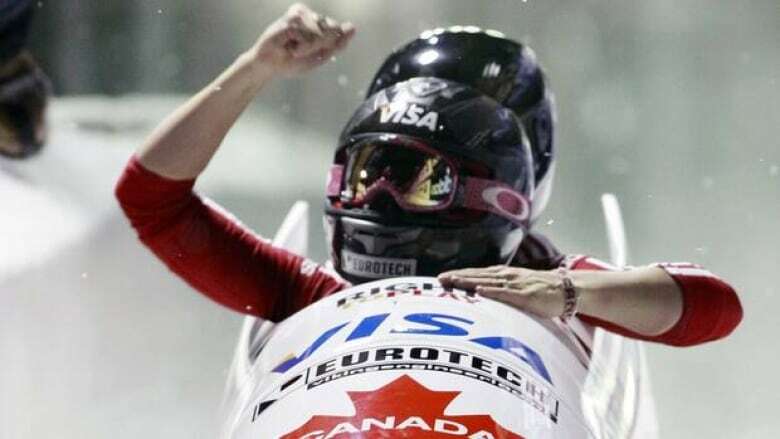 The reigning Olympic champion and brakewoman Jennifer Ciochetti finished the competition on Saturday night at Mount Van Hoevenberg with an aggregate four-run time of three minutes 48.57 seconds to give Canada its first gold at worlds since the women's race debuted in 2000. Humphries, who won bronze at worlds last year at Konigssee, Germany, held the lead after every run and beat three-time world champion Sandra Kiriasis of Germany by 0.33 seconds. "It feels amazing. It is another goal accomplished," Humphries said. "This means a lot to me. I feel like I'm still growing as a pilot and I try to learn from every experience. I have been working on my consistency and I'm glad it showed here." Elana Meyers and Katie Eberling, in their first worlds for the United States, took the bronze, one second behind the winning sled and 0.25 ahead of defending world champion Cathleen Martini of Germany. Franziska Bertels replaced Janine Tischer as Martini's brakewoman for the final two heats. "It feels so awesome, and to do it with the home crowd is even more amazing," Meyers said. "It's more than I could ever have expected in only my second year [driving]. I'm pretty excited." It was the second straight victory for Humphries and former driver Ciochettti, who teamed up last week for the first time ever to win the final World Cup race in Calgary. "It's definitely tough to move from the driver's seat to the brakes, but it was for sure worth it," Edmonton's Ciochetti said. "Emily [Baadsvik] was so gracious in accepting me doing this with Kaillie. It has been a great two weeks. We are now World Champions and it is always sweet to win." Jazmine Fenlator and Ingrid Marcum of the United States finished 10th and Bree Schaaf and Emily Azevedo were 12th in USA-2. A steady snow began falling before the night competition, but the track remained fast. Humphries entered the second day with a 0.41 advantage over Kiriasis and lost just a hundredth on the first run as the leaderboard remained the same. None of the 17 sleds in the field advanced to a higher position on the third heat and the top eight sleds held position on the final run. On Friday, Meyers had the second-fastest time on the first run, ahead of every sled in the race except the shiny white one driven by Humphries. A few slipups on the second and final heat that day relegated Meyers to third heading into Saturday's finale, a daunting half-second behind Humphries but in medal contention, just 0.09 seconds behind Kiriasis. Meyers and Eberling had the fastest start on each run and finished the third run in 57.41 seconds. It was the third-fastest time in the heat, and while she fell further behind Kiriasis, she still held a comfortable 0.27 edge on Martini heading into the final run. Meyers finished 12th on the World Cup circuit, skipping three of eight races to train for worlds here. American women also have won four silvers at worlds. Jean Racine was second in 2000 and 2001, and Shauna Rohbock captured the last two before retiring. Germany had won seven of nine races since the event debuted in 2000. Fenlator's performance was a personal triumph because her mother, Suzie, a stroke victim with heart problems and other health issues, was cheering at the start for the third run and at the finish when the night was over. Fenlator, a former Rider University track standout, had to train in Lake Placid during the fall knowing that her mom was often sleeping in a car after her New Jersey home was heavily damaged by Hurricane Irene. "I think she's doing great. It's nice to finally see her race," Suzie Fenlator said, fighting back tears as she leaned on a cane, cowbells reverberating in the Adirondack Mountain air. "I'm feeling jubilation. Praise to God that I made it through to see this." Earlier Saturday, Steven Holcomb piloted a two-man sled he had never raced to second behind Lyndon Rush of Humboldt, Sask., halfway through the men's two-man competition. Holcomb and brakeman Steve Langton drove USA-1 into contention for the gold medal, recovering from a shaky first run to finish just 0.12 seconds behind Rush after two runs. "I like it [the new sled]. It's different," said Holcomb, the reigning Olympic champion in four-man. "I've been here two weeks training and it's taken me all of two weeks to figure it out. You've just got to go with what works. Albert Einstein said if you continue to do the same thing over and over, expect different results. That's insanity." Rush and brakeman Jesse Lumsden of Burlington, Ont., finished the two heats in one minute 51.59 seconds, while the German team of Maximilian Arndt and Kevin Kuske was third, 0.21 behind the leaders. World Cup champ Beat Hefti and brakeman Thomas Lamparter were in fourth in Switzerland-1, 0.31 off the lead. The United States had all three of its men's sleds in the top 10, with John Napier and Christopher Fogt seventh, 0.55 behind, and rookie Nick Cunningham and Dallas Robinson 10th, just 0.07 behind their teammates. Russian star Alexsandr Zubkov, who finished fourth in World Cup, was disqualified for being underweight on the first run.